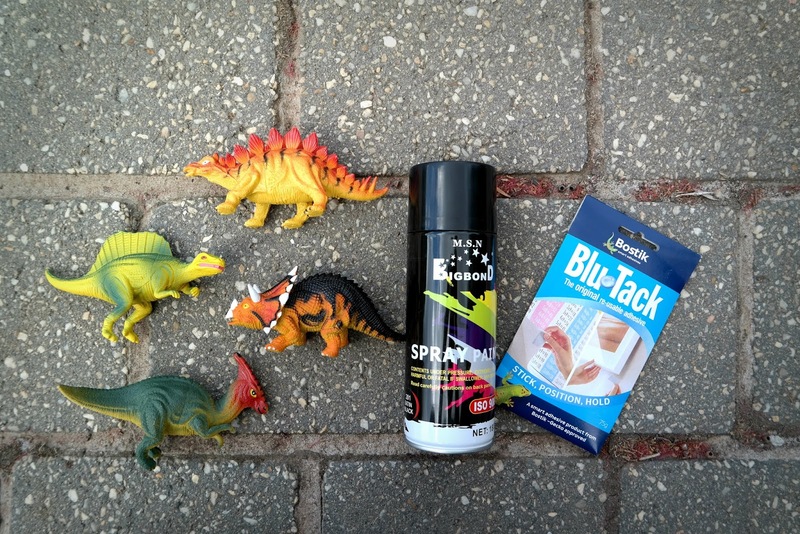 The Diaries of a Glam Mama: DIY: Decorative Dinosaurs! 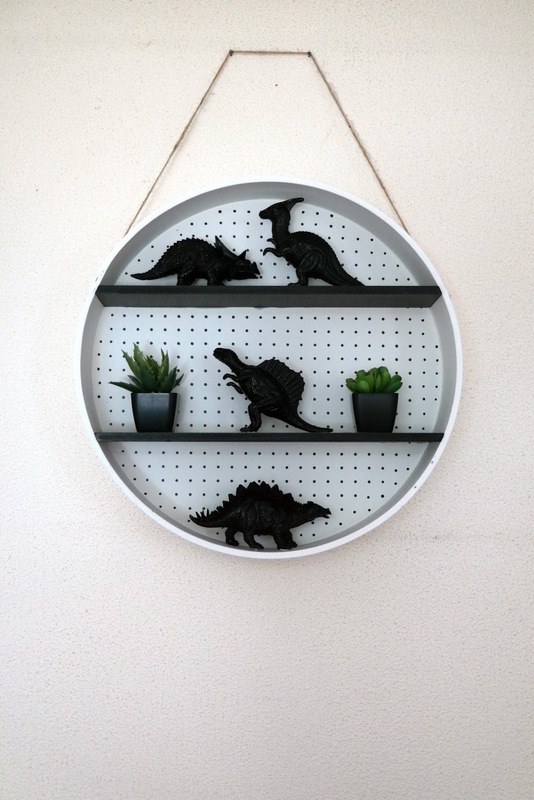 My kids are almost as knowledgeable as palaeontologists when it comes to prehistoric creatures, so when I was decorating our living room, I knew that I wanted to incorporate this shared interest of theirs. 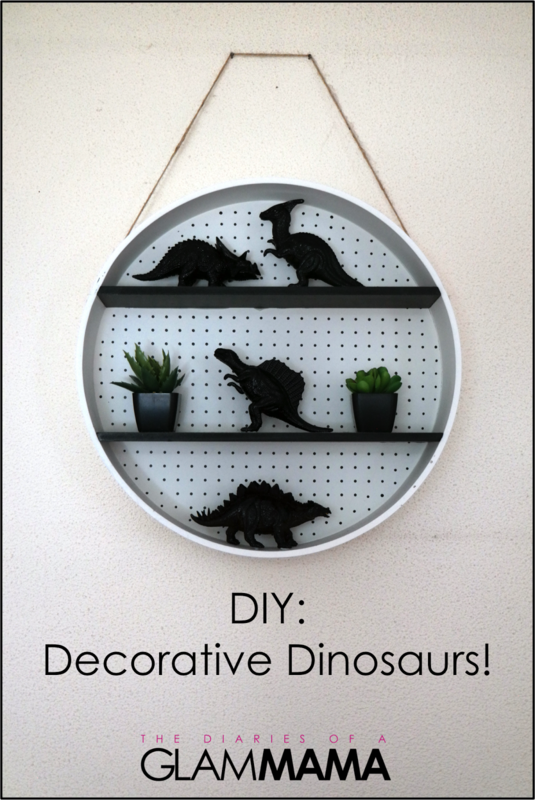 I entertained a few different ideas: dinosaur paintings or sketches on the wall, or maybe some dinosaur print toy baskets? But I couldn't find exactly what I had in mind. So then I knew I had to DIY. I was thisclose to painting silhouettes of dinosaurs onto a plain white basket, but then I found these plastic dinosaurs going for super cheap at a ToyWorld, and I knew exactly what I needed to do. And I figured, at $10 for 3, it would be a cheap experiment if it turned out to be a disaster! I would definitely recommend the cheapest of cheap dinosaur figurines (or whatever shape you're into - fruits, animals, etc). This is not the time to experiment on pricey Schleich figurines, amazing as they are. I chose a glossy black color for the cheap $2 spray paint I got at a local dollar store, but if you want something with a little bit more flair, go for metallics! I also skipped the sanding and primer like the lazy cheapskate that I am. 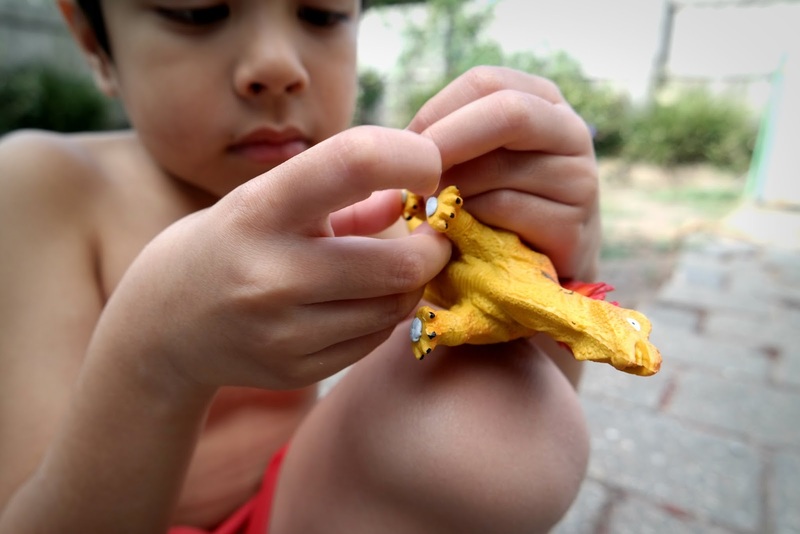 Disclaimer: These dinosaurs are not used as toys. They are purely pieces of decoration, placed far away from our children! If you decide to make these, please make sure to keep them away from children! Prep the space by setting up a newspaper somewhere with good ventilation and relatively still air. You don't want to be downwind when you spray paint, unless you want to be covered in paint! 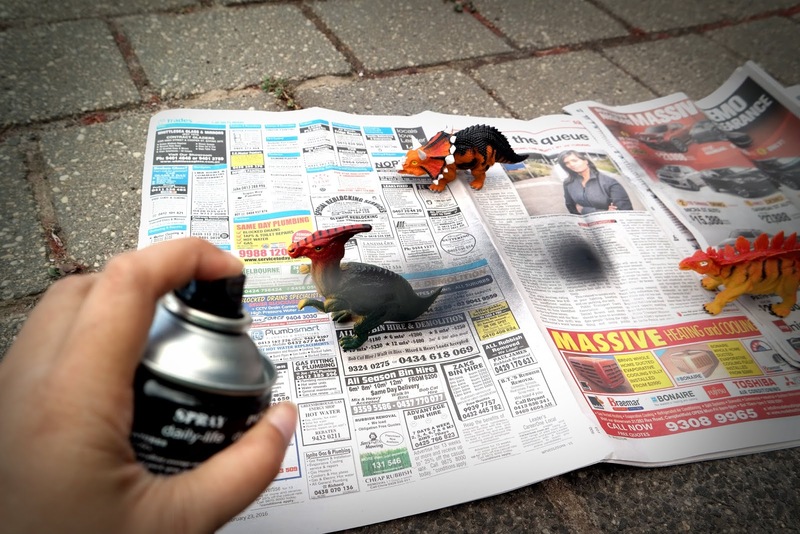 With all your figurines set far apart, start spray-painting! I did three layers on these, with at least half an hour between layers on a really dry day, and after the top sections were dry, I turned them around and painted their bottom parts too. 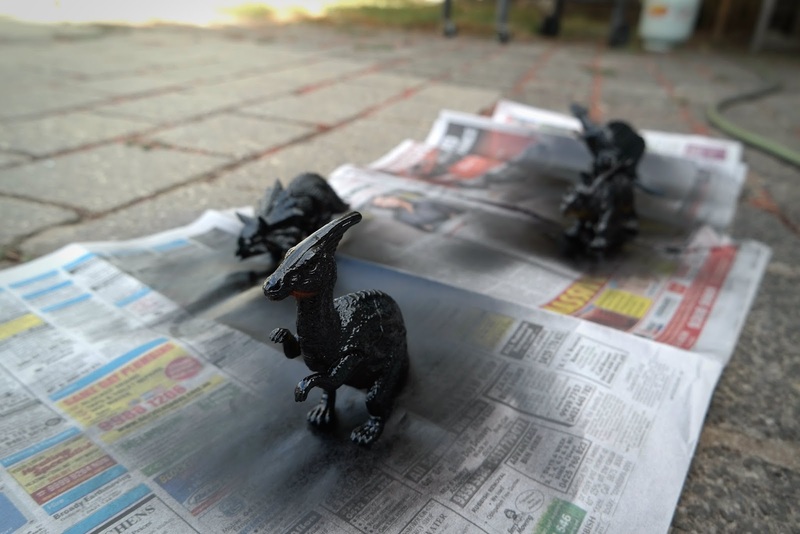 Once all the figurines are dry (I waited 24 hours after the last spray paint), bring them inside and display your creations! 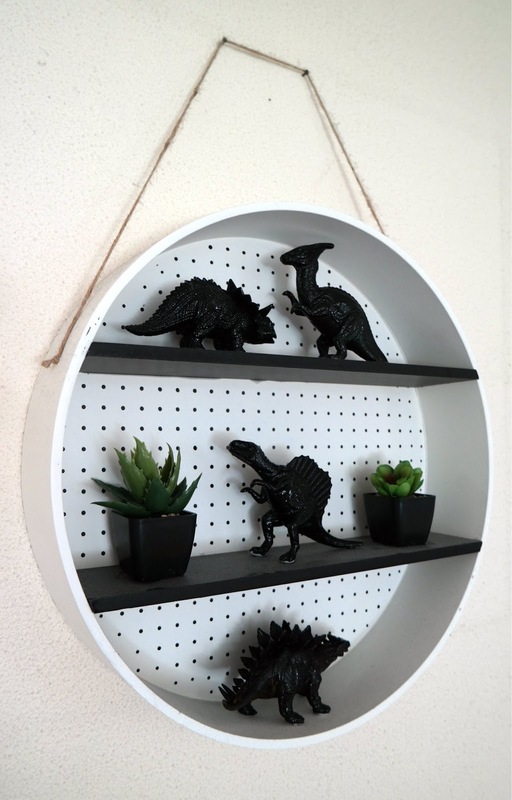 We chose to display our dinosaurs on this nifty round shelf we got from Kmart. It's sold out, but click HERE and HERE for some similar options in Australia, and HERE for something similar in Malaysia. Heck, you can even make one yourself! A Beautiful Mess has instructions for a quick and cheap one HERE. 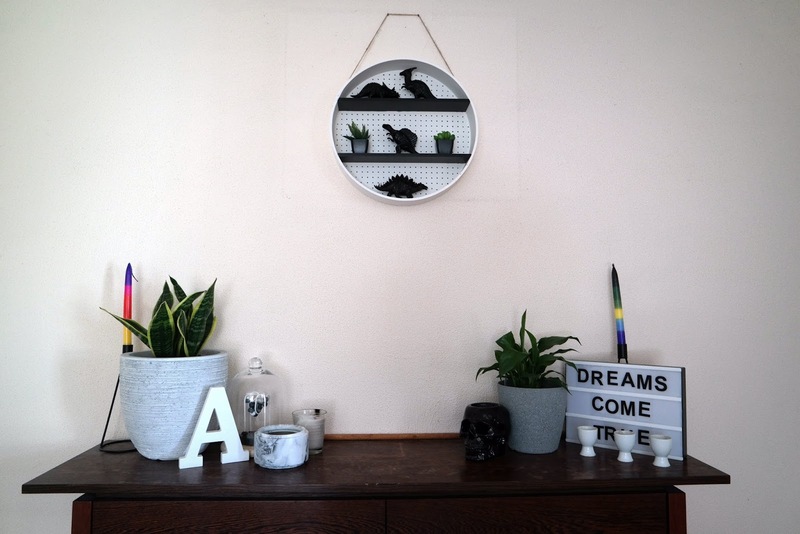 This shelf is hung on a couple of existing nails on our rented house (which is very old and full of random hanging nails on the walls everywhere) right above a beautiful console table that my father-in-law made. On the shelf are also some tiny plastic plants that I imagine our plastic dinosaurs munch on when we're not looking. The plants on the console table, however, are very much real and very obsessed over well taken care of. The dinosaurs aren't allowed near them. I'm fully planning on a visit to ToyWorld again to see what other cheap figurines I'll be able to transform into decor - any ideas on what I should look out for? Share some of your thoughts in the comments! And definitely share some photos if you've made something similar!